Helibases eliminate the problems associated with ground handling large Helikites. They allow the largest Helikites to be safely and easily handled by only one or two people whatever the weather conditions. This considerably reduces manpower costs and is far safer for the Helikite and the operators than struggling with a large half-filled helium object on a dirty tarpaulin, in a high wind. 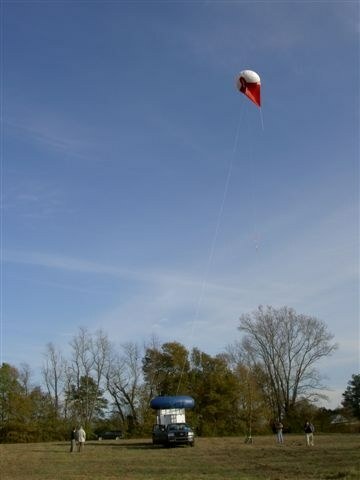 The Helibase makes Helikite deployment fast, easy, stress-free and safe. The secret to the Helibase is the sheave that is at its centre. The flying line runs from the winch to the sheave block at the centre of the Helibase and then from there to the tow-point of the Helikite. This allows the winch to pull the Helikite down onto the Helibase where it automatically docks safely without any manhandling at all. So the Helikite can be easily handled in all weathers because all the strain is taken by the winch. 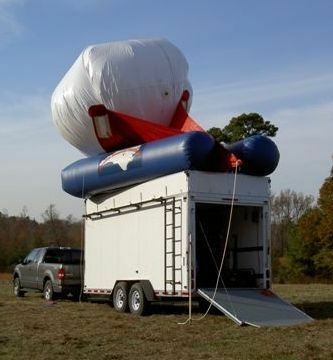 Helium inflation is made easier too, because if it is windy, the uninflated Helikite is tied down onto the Helibase from all sides so the Helikite balloon is always under control as it fills. 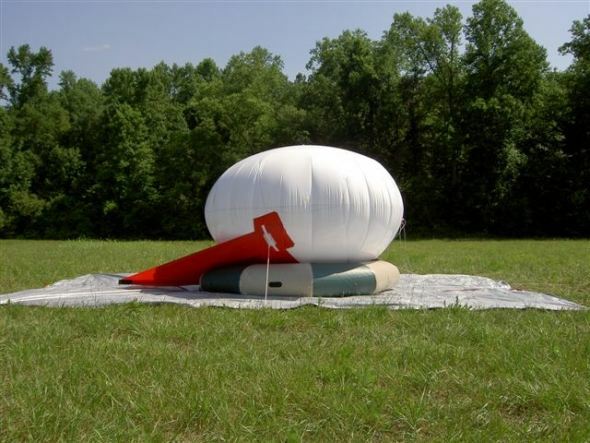 The possibility of damage to the Helikite balloon during filling is minimal. In low wind conditions only the centre of the Helikite requires to be secured. Self-cleaning. Wind and rain constantly washes it clean. Set-up in a couple of minutes. Stays inflated for months unattended. Lightweight. Easily carried by one or two people. Packs into a compact bag for storage. Muted colours suitable for military or civilian use. Versatile. Allows Helikites to be safely operated from land, roofs, trailers, boats or trucks. Soft and kind to the Helikite materials over long periods of time.